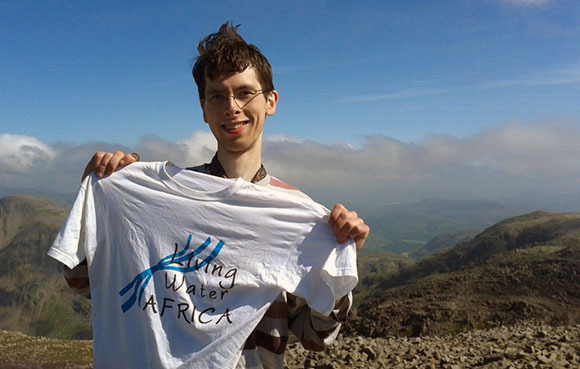 On the 19th July, Alex and almost thirty others undertook the Three Peaks Challenge. This involves climbing the three tallest summits of Great Britain – Ben Nevis (4,408 feet), Scafell Pike (3,209ft) and Snowdon (3,560 feet) – in the space of twenty-four hours. We all tackled Ben Nevis in good time, the heat was intense, but the view was stunning and I doubt that I will ever see such a sight again over the Lochs. Unfortunately from this point on we lost time as our minibus was neither fast enough to reach the Lake District on schedule nor powerful enough to climb several of the hills on the way to Scafell – the driver suddenly started shouting ‘get out and push’ at 3:00a.m. disturbing the Cumbrian dawn chorus. Nonetheless we reached the summit of the roughest and rockiest of the mountains within twenty-four hours of starting the challenge.